"Women began to arrive in the entry hall, peeling away their black outer coverings. I watched in amazement as shimmering bodies emerged from the black shrouds. One woman sparkled in a purple silk caftan, her arms gleaming with gold jewelry. I smiled to myself. If people only knew what was under those veils. I looked at their faces, artfully painted with makeup, not at all how they appeared in public: dark eyes in narrow black slits. They were like the beauties of Arab folklore. I was awed by the transformation." With only prayer and a faith that always seemed too small, Audra Grace Shelby departed with her husband and children on a one-way flight to Yemen...deep into the heart of conservative Islam. With honesty and passion, she shares her harrowing journey as a Christian woman thrust into a culture dangerously different from her own. From the friendships she forged, to her gnawing doubt and fear, to her offers of hope when her new friends' religion failed them, she gives us glimpses of a world most have never seen: behind the veils of real Muslim women--and how the grace of God touches lives in the midst of an Islamic stronghold. When Audra Grace Shelby and her husband felt God calling them to minister in the Middle East, she was fearful--how would she raise her children in the heart of conservative Islam? Armed with prayers and a faith that always seemed too small, the family made the move to Yemen, enduring deadly illness, uncertainty, and the unnerving experience of being Christians in an Islamic culture. Yet God was at work, and Audra was invited to see what few Christian women have seen: behind the veils of Muslim women. Here she shares about the friendships she forged, about the opportunities to minister when her new friends' hopes shriveled and their own religion faltered--and how the grace of God touched lives in the midst of an enemy stronghold. With humor, passion, and honesty, she shows readers glimpses of life deep in the heart of Islam and the yearning heart of our loving God. 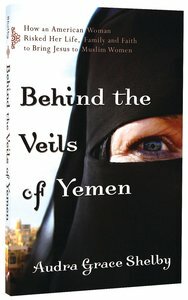 About "Behind the Veils of Yemen"
Customer Reviews For "Behind the Veils of Yemen"
This is a really interesting account of life inside the Muslim community of Yemen, describing life from a woman's point of view. But it's much more! Audra Grace Shelby starts with her own call to the ministry and goes on to describe the training, the farewells, the adjustments and the challenges common to so many missionaries. I really appreciated her honesty - being a missionary is not all glamour and appeal. It's hard work learning a new language, living in a different culture and perhaps not seeing a conversion for years of hard work. Audra also takes us behind the veils to give us an intimate look at the lives, conversations, thoughts and feelings of the women of Yemen - the women Christ loves and the women Audra comes to love. It's an easy to read personal account and I felt privileged to have shared this part of Audra's journey.